JMPE | Oh, I Juggle! “Where is the sticky stuff we make rotis with?” Y asks V after searching the kitchen cabinets for readymade dough for a botched up surprise breakfast of alu parathas. Introducing Y, a smart professional with an MBA from one of the top institutes in the country, but unbelievably naive when it comes to domesticity. Y feels she is too young to get married and has maintained a ‘let’s wait’ stance ever since V popped the question. She says an impulsive ‘yes’ when V stands by her, stroking her hair as she is vomiting! Not very romantic when said like that. But isn’t this how love evolves in marriage? Knowing that building a life together is more than sitting around candles and roses and romance is standing through difficult times, beside the one you love. Most of the difficulties Y and V face are, however, self inflicted. Each of those ups and downs tickles and touches the heart at the same time. Yashodhara Lal beautifully marries emotion and humour and makes them work together wonderfully well. ‘Just Married, Please Excuse’ is the heartwarming story of Y and V, how they come together in holy matrimony and go through all sorts of unholy experiences that couples adjusting to new roles go through. V is poles apart from Y in most respects but his devotion to her and her childlike ways is endearing. I love humour and most of my appreciation is shown by smiling. I rarely laugh out loud. It is probably because I am tough to impress and also because I don’t find crass ‘in your face’ humour funny at all. As I balanced JMPE in one hand and patted my baby to sleep with another, both he and I were surprised by the frequent chuckles escaping my throat. If the book could do that to me, I can safely bet that most of you will be clutching your bellies and tearing up with laughter. Even when I was not laughing, I was grinning and nodding throughout. My husband, who rarely comments on what I read, became quite curious and asked me what the book was about. Humour is extremely difficult to execute well. Yashodhara is a natural and does her job with great finesse. All the characters in the book grow on you and stay with you long after you finish reading the 255 pages. I feel as if I have known and loved Y for a long time. My measure for great characters is how long they stay with me after I turn the last page of the book. I finished reading nearly ten days ago. I still get a warm fuzzy feeling when I think of Y. Just like the kind you feel when you think of a friend. You could try and win a copy by participating in the contest. Even if you don’t win, just go ahead and order your copy online. If, like me, you insist on great quality of narration and love humour, you will not regret it. 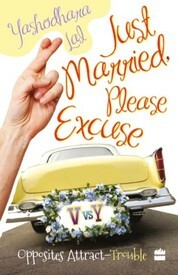 Yashodhara Lal, author of Just Married, Please Excuse is hosting a contest on her blog. You just have to write a post about a funny incident from your married life. The chosen ones will win a copy of JMPE and the Delhi based ones will also get a free lunch and great conversation with the author herself. I was one of the lucky firsts to win my own copy of JMPE from the giveaway. I thoroughly enjoyed reading it. I will share more thoughts on the book later. I just wanted to tell you guys not to miss this opportunity. Sift through your memory files. Choose something funny and get your creative juices flowing. P.S. Hey Yash, any plans of visiting Hyderabad?